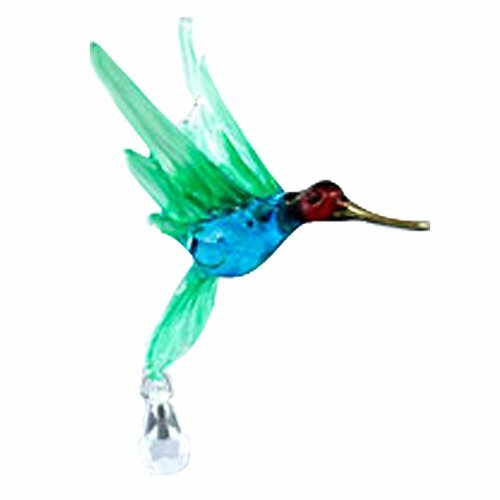 Glass hummingbird ornaments are a great way to jazz up your garden. 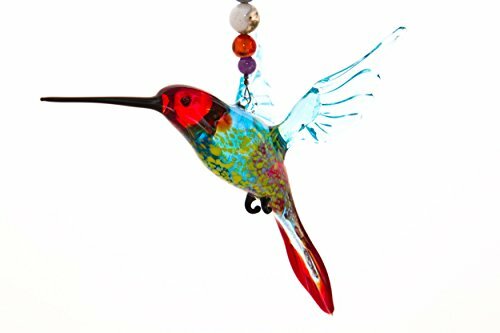 I bought this hummingbird ornament and have used him both inside and outdoors. To say I love hummingbirds is a major understatement. I am totally fascinated by them. While I’m not a theme-y (is that a word?) 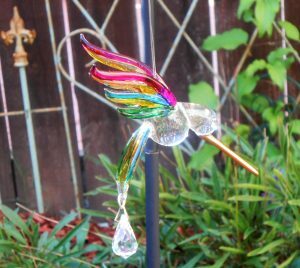 kind of person, I do go a little crazy with hummingbird yard art. 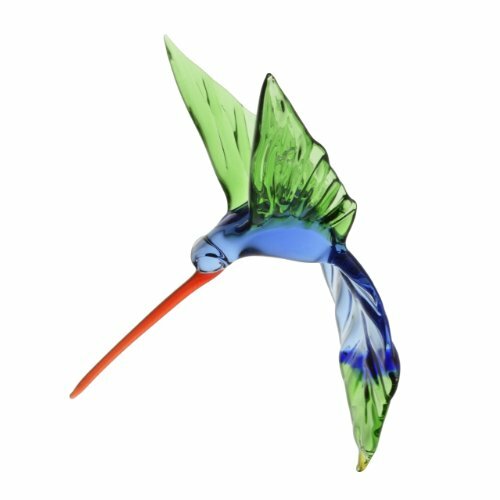 So maybe I’m biased but really, every garden needs a glass hummingbird ornament. 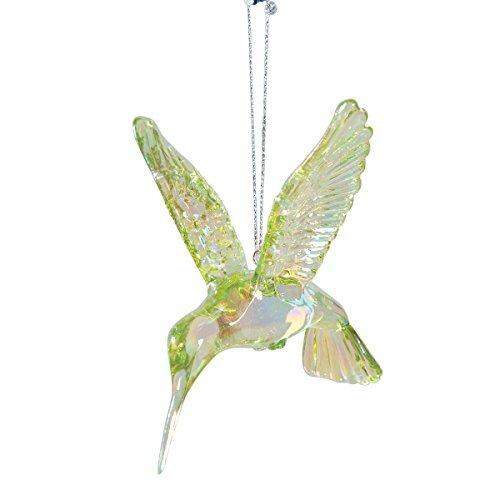 Glass ornaments can be a little delicate, so please take care where you place your hummingbird ornament. When my glass hummingbird ornament is hanging out in my garden, I’m really careful where I place him. I’ve found hanging him from a short Shepard’s hook away from foot traffic works well. Additionally, placing your hummingbird ornament lower to the ground reduces wind gusts that could cause potential damage. Also hang your hummingbird just by the little string that he comes with to reduce the chance of him hitting something as well. 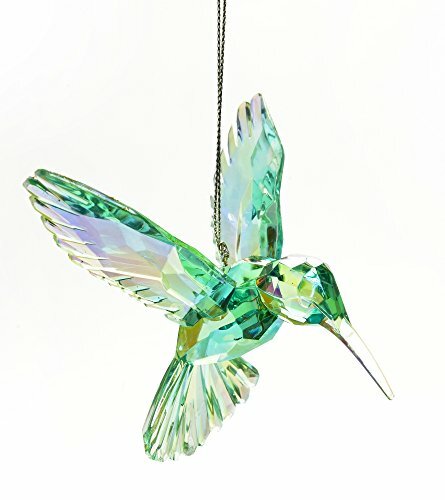 I’m considering decorating with hummingbird Christmas ornaments. Maybe I will even put a tree outdoors in the garden with Hummingbird ornaments. Check back if this interests you as I will certainly post pictures. 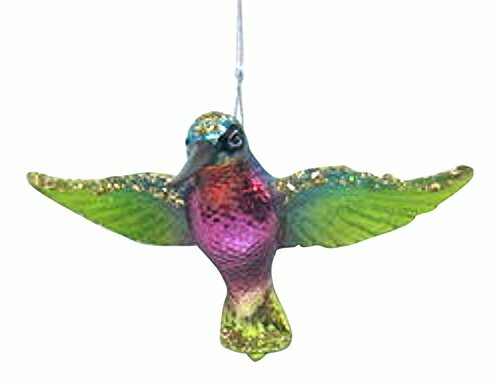 Do you have an idea for using hummingbird ornaments to decorate for Christmas as well? 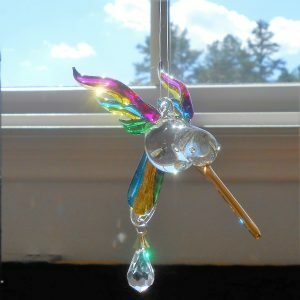 Colored Glass, glass hummingbird ornaments, hummingbird ornaments, Hummingbird yard art, Suncatchers.